This Sunday, May 29, it will be the 86th edition of the race which started as a commemoration of the dead British & South African soldiers who were the casualties during World War I. It was created by a retired British Army Officer to honor his “comrades” who died as heroes during the World War I Campaign in South Africa, hence, it was named as the Comrades Marathon. If they have the Comrades Marathon in the continent of AFRICA, then we have also the Bataan Death March 102K & 160K Ultra Marathon Races in ASIA. The reason and purpose of the two running events are similar but Bataan Death March attracts more interest due to its historical significance, popularity and involvement of war’s atrocities and heroism of the Filipinos and Americans. The following link will describe in details the history of the Comrades Marathon from its origin up to its last edition last year. Due to the popularity of the Comrades Marathon in Europe and USA, I read somewhere and overheard other ultra runners saying that you are finally called as a “full pledged ultra runner” if you have finished the Comrades Marathon within the prescribed cut-off time of 12 hours. It is for this reason that I am already making my travel preparation and training for the next year’s edition of the race! God willing. In the Philippines, a runner is not a full pledged ultra runner if he/she has not finished the BDM 102K Ultra Marathon Race within the prescribed cut-off time of 18 hours. It is my personal declaration and I will stand by it. You can browse more about how to join the Comrades Marathon at their website at www.comrades.com. Let me remind all the runners who are interested to apply to join the 2012 Bataan Death March 102K Ultra Marathon Race (BDM 102) that the deadline of acceptance of letter of intent will be on September 1, 2011. Such deadline is also true to all runner-applicants for the 2012 BDM 160K Ultra Marathon Race. There will be no extension of deadline on this matter. Since the deadline will be on September 1, 2011, those who have not yet finished a Marathon Race (42K) have two (2) Marathon Races where they could qualify. The earliest is the Manila International Marathon which will be held on June 26, 2011 and the later one will be the MILO Marathon Manila Eliminations on July 31, 2011. The month of August does not have a local Marathon Race scheduled not unless the runner would opt to finish a Marathon Race outside the country. Personally, I suggest runners without any Marathon experience to join the Manila International Marathon. Looking at the published Race Route, the course is flat and fast as it will cover the roads along the Roxas Boulevard-CCP Area-MOA Area-Macapagal Avenue, however, the runners will have to do two loops of these areas. It’s better than doing three (3) loops! I am sure MILO Phils. will not repeat their Manila Marathon Elimination Race Route last year because of some complaints and tragic accident. However, if the runner does not have enough time to prepare for the earlier marathon race, then the MILO Elims would be the appropriate Marathon qualifier before the deadline of BDM 102 application. Again, the “only qualifier” for the BDM 160 is to finish the BDM 102. If you are qualified for the 2012 BDM “Grand Slam”, the deadline of application is still on September 1, 2011. Please relay this information to the other runners who are interested to join the BDM Races. For BDM Races updates and details, please visit http://bataan102.blogspot.com. I am not referring to Rock Bands. 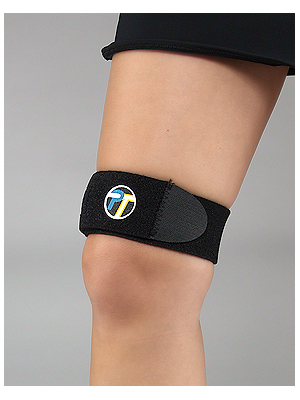 These are strap bands that are very popular among athletes, most especially to runners. For the past weeks, I could not run without using these bands. 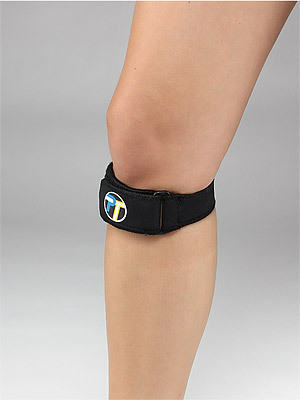 They are simply called PT Bands or Pro-Tec Bands, their brand name. For the first two weeks, I’ve been using the PT Runner’s Knee Band on my left leg which is the one where I’ve been injured. 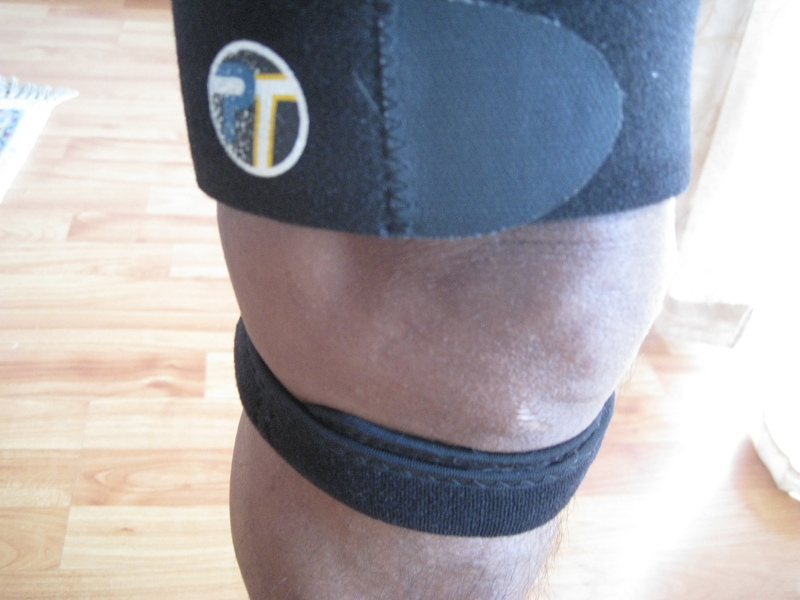 However, instead of placing the front of the band beneath my knee cap, I place the “hard” part of the band behind my knee in order to relieve a mild pain on it. After two weeks, I was able to buy a Pro-Tec IT Band Strap which I use to strap my lower left quads. The said strap was able to relieve the pain on my lower quads whenever I over exert my left leg. This strap had been a good medical aid during my runs. I’ve been putting some miles again on the road and trails by running and hiking and these two bands (Knee and IT) had been helpful in easing the pain on my leg. This is how it looks when they are strapped on my left leg. My Left Leg With Straps! I could be hard-headed again with my treatment and recovery but it makes me CRAZY & bored if I can’t run/walk at least once a day no matter what the distance is. The following is an article that I copied from a trail running book which I want to share to my readers, whether you are a newbie runner or an accomplished/competitive ultra runner. You can share also your answer to the said question on the title. –Personally, I love it–the pain, I mean. But most importantly, I view the pain as the engine to drive me to reach my goals. In other words, I know I’m hurting because I’m on hour four of a six-hour effort and that I’m that much closer to seeing nature in full effect. Or, that the pain is getting me through a technical uphill section. The pain is an indication that I’m do-ing! –I train so I don’t hurt any more. –I tend to agree; when I was most prepared to race, pain wasn’t much of a factor. The validation came in competing against others. –I was getting massage last night, and the therapist asked, “You do work your body hard, don’t you? What is your motivation?” I didn’t know what to say, mainly because my face was being shoved into the hole as he stretched my calf and it was hard to talk anyway…but he made me think. I don’t know that I have a good answer, but I agree that training is to avoid future pain, I also know that I absolutely love being out in the wilderness, and the harder I train, the more time I am able to spend in that environment. –It’s all about the balance. You feel so good afterwards because you suffered through the pain during it. The sweetness of completing something wouldn’t be the same if it was easy to do. Being in pain, working through it, and finishing bring the accomplishment more meaning. –I say it’s like most things in life: combo platter. –I don’t love pain…but it makes me stronger, and in that way it helps me achieve my goals. I think the key to the answer lies within our personal goals. –Balance. For me it’s all about the three-part teeter totter: sport, family, work. Each causes (good) pain the harder you try at it, and all must be in balance to make each truly meaningful. –Maybe we like the pain. Maybe we’re wired that way. Because without it, I don’t know, maybe we just wouldn’t feel real. What’s that saying? “Why do I keep hitting myself with a hammer? Because it feels so good when I stop.” I can’t take credit for the qoute, but it seems somewhat appropriate. –I love it and think that more is fun but moderation is the key to longevity and health. I’m enjoying my Boston Marathon hangover. Pain is relative. I just wish I could recover quicker! –If pain feels good, if pain = pleasure, then is it really pain? But I am proud to be one of the finish-line crossers so maybe pain = proud. –It’s not the pain that’s enjoyable, it’s the feeling of accomplishment and daily reinforcement that your body is adapting—getting stronger and/or faster. Pain is a reminder that you pushed hard. We need to be more aware about the weakest point in our body, as that seems to break first. Strengthen the weakest part to keep the rest in balance. –So many times I’ve been asked if I love pain. Or, why do I put myself through all this “insane training and criminal early (very early) morning runs?” And I have questioned myself, too: why? I love pain, I do, it make me feel alive! It makes me feel I trained, I paid my dues, I have a right to be where I am. Too crazy? Maybe. I have created and organized the Philippine Association of Ultrarunners (PAU) as the official sports federation on ultrarunning (road races, trail races, 6/12/24/48-hour endurance races and multi-day stage races) in the Philippines which is under the umbrella and approval of the PATAFA. PAU had been an accredited member of the International Association of Ultrarunners (IAU), the world’s governing body of ultrarunning. In my research, I was able to read the blog of Scott Dunlap and found out a post which he published on February 16, 2005 where he interviewed Nancy Hobbs, an ultra trail runner, Race Director, co-author of the book The Ultimate Guide To Trail Running, and Founder of the All American Trail Running Association (AATRA). The following is the link on the details of Scott Dunlap’s interview to Nancy Hobbs. I hope the Race Directors in Ultra Running in the country will be able to learn from this, to include the ultrarunners. Don’t be confused with that simple arithmetic. I am now 59 years old, 3 years after my retirement from the military service and 4 years after I have renewed my dedication and time in serious running and be the Bald Runner. To celebrate the day, I would have to run 59 kilometers but with my recovery from injury, I would be committing a “suicide” and make my condition worse. It was a choice of running 59 minutes or 59 seconds or walking 59 steps or 59 meters or running 5 + 9 = 14 kilometers. To make the day significant, I had to run without any pit stop. I added the two numbers in my age and I was able to run 14…miles, not kilometers! That is equivalent to 22.4 kilometers with some additional yards & feet as change. I finished the distance in 2:35:20 hours with an average pace of 11:02 minutes per mile (6:51 minutes per km) and an elevation gain of 1,120 feet (342 meters). It was a slow and easy run but it was worth every pace and stride of it. One year more and I will be a dual-citizen…Filipino + Senior Citizen. I was able to get a “tip” from Sir Amado Castro Jr aka Reinier6666 that the Senior Citizens have a lot of privileges to include free movies on Mondays; free admission at the ULTRA Oval Track; 20% discount on meals in restaurants and purchase of medicines in drugstores; and if I declare my residence in Makati City, I would be receiving medical privileges in their hospitals and one sack of rice (?) and birthday cake every time I celebrate my succeeding birthdays. Sir Amado and I made a deal to be meeting every Monday for meals and movies after “race walking” with him at the ULTRA Oval Track as soon as I will get my Senior Citizen’s Card next year! I would like to express my sincerest thanks to those who greeted me at Facebook (400+ friends out of 1,125), through e-mail, SMS, and personal greetings. It took me hours to reply each greetings from my Wall which I truly enjoyed. As usual, Jonel aka FrontRunner was the first to greet me and Sir Amado had the longest message. Thanks, Jonel & Sir Amado and to everybody. I will still be running but more on ultra marathon (and marathon training for a Boston Qualifier and as LSD workout) and this blog will be featuring more on ultra marathon training and activities. And I will be adding “hiking and backpacking” as my other cross-training sports activity (not necessarily posting my journal here in this blog). I want to be like this (excluding the hair!)…. 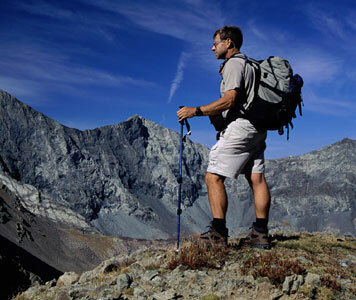 Watch out for the Bald Packer or Bald Hiker or Bald Backpacker or Bald Ultra Walker! Any suggestion? Finally, the then famous Manila International Marathon is being revived this year. I am not sure if the use of 30th edition of this race is proper as I know that some of the editions in the past had never been conducted. I hope my friend, Red Dumuk, shall make some adjustments on this. However, I appreciate the posting of this article on the website of the said Marathon Race. If my memory serves me right, this was my first Marathon Race and Red Dumuk specifically mentioned my name and my finish time. Thanks, Red for bringing back those good memories of Road Racing in the 80’s. Running great, Bill Rogers, winner of four Boston Marathons and four New York Marathons, apprised of the race route and the weather conditions, predicted 2:20 as the winning time in the inaugural Manila International Marathon. His visit to Manila came at the heels of his dismal performance in Japan. As he was off-form, he begged off from showing his form in the MIM. Rogers’s fearless forecast was way, way off. 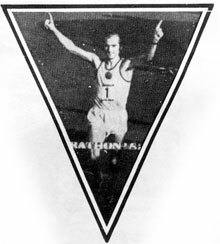 When East German Waldemar Cierpinski, second only to Ethiopian Abebe Bikila to have ruled back-to-back Olympic Marathons (Bikila turned in the trick in 1960 Rome and 1964 Tokyo Olympic Games while Cierpinski in 1976 Montreal and 1980 Moscow), breasted the tape with President Marcos heading the spectators, the display clock showed 2:14:27, a good 5 minutes and 33 seconds inside the expected time. The time could have been lower had there been stronger challenge. After 5K, the MIM morphed into a battle against the clock for Cierpinski, who in 1976 frustrated 1972 Munich gold medalist Frank Shorter’s bid to join Bikila as back-to-back Olympic Marathon champion. In the 1976 Olympic Marathon, Cierpinski beat Shorter, considered to have ignited the running boom in the United States, by 49 seconds (2:09:56 against 2:10:45). Cierpinski’s winning time which is 3 minutes and 24 seconds outside the clocking he posted in Moscow Olympics less than two years earlier can be better appreciated against the backdrop of marathon times in other parts of the world held in different seasons in 1982. Runner-up American serviceman Phil Camp might have found Cierpinski out of his league but his 2:19:39 timing would have outweighed the first placers’ in four of the above marathons. The last berth in the podium was hotly contested by Chang Ming Chen of Chinese-Taipei and Peng Jiazheng of the People’s Republic of China. There was a sideshow even. A PROC embassy official protested minutes before the cannon fired off the marathoners the display of the Republic of China’s flag on Chang’s singlet and threatened to pull out Peng from the marathon. We explained to the embassy official we were aware if Chang has to show a flag on his breast, it should be the IOC designated banner. We added we subscribe to the one-China policy of the government. Then, we convinced Chang to have the ROC flag covered with a masking tape. Had Chang not acquiesced, disqualification awaited him. When the smoke of the conflict had settled, so to speak, Chang outstripped Peng by 59 seconds–or just about the time it took the former’s official to tape that offending flag–to claim the third position. Chang’s 2:26:49 clocking bested winning times of two 1982 AIMS events. Peng’s 2:27:48, on the other hand, beat the champion’s time of one of the AIMS member marathons. Great Britain’s Tim Johnston (2:31:31) rounded out the top 5 finishers. He crossed the finish line two minutes and 30 seconds ahead of the first Filipino finisher, Army man Ricardo Carillo (2:34:01). Landing in the top 5 among the locals and top 10 overall were Manuel Carmelo (2:35:28),7th; Guillermo Padilla (2:37:31),8th; Ireneo Illut (2:38:01), 9th and Carlito Solis (2:38:06), 10th. Fifty-three runners (only seven were foreigners) registered sub-3 hours clocking. By comparison, looking at the results of the recent marathons in the country, less than 10 runners with sub-3 times seems to be the current norm. In the distaff side, only the 11-year old wonder girl Joan Laput, tops among the 11 lady finishers, broke 3:30. Laput ranked 173 overall with her time of 3:28:22. Laput’s “preys” included priest marathoner Amado Picardal (3:20:16, 195th), the Baldrunner (3:58:44, 286th) and arguably, the country’s No.1 race organizer Rudy Biscocho (4:40:02, 440th). Of the 603 hopefuls who answered the starting cannon, only 30 did not finish–a remarkable mortality rate of measly 4.98%. The most courageous and greatest survivor was cardiac patient Teofilo Espejo, Jr. He placed 509th with a time of 5:11:16. Asst. Race Director Colmenares running and finishing the MIM spoke volumes about the organization and management of the race. He clocked 3:47:50, good for 281st position, well in the upper half of the finishers. It would be great seeing another Philippine President accommodating the top 200 finishers of a marathon or any road race of prestige in Malacanang and treat them to dinner after the awarding ceremonies where he would trace the history of marathon even as he extols its virtues in his address. In another first, the country’s top sportscaster then Joe Cantada found his equal in Katherine Switzer during the coverage of the 1st MIM. Joining the fun was Zal Marte, another sportscaster of note. This would never be duplicated. “The Voice” has passed on to the great beyond. As recognition for a job well done, Race Director Dorotheo’s peers in AIMS elected him as member of the original batch of Board of Directors. It goes without saying the Manila International Marathon was accepted as full-fledged AIMS member barely four months after its initial edition. Dorotheo was to be reelected to the AIMS Board. And from the locals, what was the reward? The second MIM saw the size of the field doubled.